Not to realize that it’s not generic — it is Jewish. The fullest version comes from Matt 6:9-13. most often recited in the KJV. Our Father who art in heaven, hallowed be thy name, the kingdom come, thy will be done on earth as it is in heaven. Give us this day our daily bread and forgive us our trespasses as we forgive those who trespass against us and lead us not into temptation but deliver us from evil, for thine is the kingdom and the power and the glory forever, Amen. 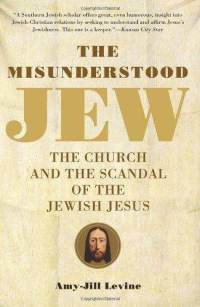 I’ve been reading through for a second time The Misunderstood Jew: The Church and the Scandal of the Jewish Jesus by Amy-Jill Levine. I met her when she came to Memphis last week for a couple of lectures. I’ve benefitted from her work for several years, particularly since she is a Jewish New Testament scholar. In an age when there are many misinterpretations of the New Testament because of a lack of understanding of Judaism, and Jews and Christians continue to misunderstand each other, she is a strong provider of aid for both of these problems. Her book is partly about the Jewishness of Jesus and partly about Jewish-Christian relations. In the former part she devotes a few pages to the Lord’s Prayer. The problem she seeks to address is its “familiarity.” Since most churches recite it often and have done so for so long, Christians tend not to stop and think about what it means. And what it means in the first place has to do with those who originally received it–not Western Christians, but first-century Palestinian Jews. Not to us, but for us. “When placed in a first-century Jewish context, the prayer recovers numerous connotations that make it both more profound and more political. It fosters belief, promotes justice, consoles with future hope, and recognizes that the world is not always how we would want it” (42). What does Levine uncover about the Lord’s Prayer? Well for one thing, she points out one thing that scholars have known for a while but the public has had trouble learning: while the Aramaic abba may lie behind the Greek translated “father,” it doesn’t mean “daddy.” It simply means “father” as is evident from other Jewish sources and this is should be obvious in light of the fact that every time it occurs it is followed by the Greek translation “pater,” i.e., “father.” Even the scholar who originally proposed “daddy” as a translation for abba believing that it was the word used by little children later retracted his own thesis. But the church really liked the idea of Jesus saying “daddy” so it stuck. Asides from this, another key detail of Levine’s conclusions on the first line of the Prayer is that just as there is overlap with many key New Testament terms for Jesus and the Roman emperor, such as “son of God,” “savior,” and “lord,” there is another with “father.” This would explain why Jesus specifies “our Father who is in heaven.” Levine writes, “By speaking of the ‘Father in heaven,’ Jesus thus insists that Rome is not the ‘true’ Father” (45). This hint of an anti-Rome stance is seen more explicitly in what follows “Hallowed by your name,” which is a feature of most Jewish prayers (45). “Your kingdom come” correlates to the common Hebrew expression olam ha-bah, “the age/world to come.” This is distinguished from olam ha-zeh, “this (present) age/world.” Christianity is obscured if one doesn’t grasp this key Jewish idea. Christian eschatology, i.e., the ideas surrounding “end times,” is not identical to the Jewish conception, but it is thoroughly rooted in it. World history is divided into these two stages for Jews, this present age that we are living in which is marked by sin, evil, and injustice. In the coming age, or the future age, this sin, evil, and injustice would be dealt with as God issues his judgment and through is kingdom reigns on earth forever. Christian eschatology features the same idea of the present evil age and the coming age of righteousness, but it is with Jesus that the coming age has come into the present age. In Christian thought, then, the coming age has been inaugurated even if the present age isn’t over yet. The Christian is waiting for the Messiah to come back; the Jews is waiting for the Messiah to come. So when the Christian prays “your kingdom come, your will be done, on earth as it is in heaven,” the Christian prays for the coming age (or “world”; the word can mean either one or perhaps both) to come in fullness on the earth as it already is in heaven. Christian eschatology, then, is not about people going to heaven but about God coming to earth. This is a thoroughly Jewish, and properly biblical, idea. It gets really interesting with Levine’s discussion with the next line. “Give us this day our daily bread” as a translation is redundant (47). The word in question, “daily “is epiousion is tricky but probably best translated as having to to do with the next day. The best translation of the line would then be “Give us tomorrow’s bread today,” which makes plenty of sense in a Jewish context. Jewish texts continually associate the olam ha-bah with a banquet. This would be another way of saying “your kingdom come,” or, in Levine’s paraphrase: “Bring about your rule when we can eat at the messianic [kingdom] banquet” (48). I also like Levine’s preferred rendering of “Lead us not into temptation.” It probably is best as “Do not bring us to the test” (50). “Test” and “tempt” are a couple of meanings of the same Greek word. God is better known in the Old Testament for bringing us to the test instead of leading us straight into temptation. Based on these situations, Levine paraphrases this line: “Do not put us in a situation where we might be tempted to deny our faith or our morals” (50). This would have been an especially meaningful prayer for first-century Jews and early Christians. Levine is right to point out that “deliver us from evil” is actually better rendered “deliver us from the evil one.” All scholars I’ve seen favor this translation based on the Greek construction, and in light of the fact that evil is never just a general idea in the New Testament but is always personified. The latter part the doxology “for thine is the kingdom and the power and the glory forever, amen” is not original to Matthew’s version of the Lord’s Prayer (42). It actually comes from the Didache, originally, an early Christian text that didn’t make it into the canon. Why is it in our version of the Lord’s Prayer then? Congregations that recite the Lord’s Prayer typically have kept with church tradition of the past few centuries and recited the version from the KJV. One of the main reasons we have newer translations of the Bible than the KJV is that we now have much greater knowledge of the original wording of the New Testament than they did in the 1600’s. As manuscripts of the biblical documents were copied, changes were introduced and reproduced. It is a compilation of all these manuscripts which produces what we call an eclectic text, i.e. an entire Greek New Testament pieced together from the text of all the known manuscripts, guided by what scholars believe most likely reflects the original wording of the authors. This is why this doxology is no longer included in the text of newer translations of the Bible; it is very clear that this is not original to Matthew. It was added to later copies of the Gospel, most likely because of its place in the later tradition which we now find in the Didache. I remember being in church one Sunday morning and the preacher that day covered the Lord’s Prayer. (This wasn’t a church where we actually prayed it together, so it was good that it at least made it into a sermon.) I’ll never forget this one instance where I knew it was important for the preacher to be educated in order to anticipate people’s questions and to provide them some guidance. When he got to the end of the Lord’s Prayer, he preached the doxology. He wasn’t working from the KJV, but the New King James Version. The New King James Version may be the most worthless version of the Bible out there. Probably the only good reasons to continue to read from the KJV is the tradition behind it and its beautiful diction. The NKJV is not traditional, loses the beautiful diction since it is an updated version of the KJV—and it retains the obsolete text of the KJV. A couple sitting in front of me obviously weren’t reading from the KJV or the NKJV. How did I know this? Because they were confused. She looked at his Bible and showed him hers; he looked at hers and showed her his. They didn’t have the doxology in their version of the Lord’s Prayer. And I was completely sympathetic. For people who apparently had no idea about manuscript differences and eclectic texts, it was understandably quite shocking and confusing to listen to a sermon on a text that wasn’t in their Bibles. It appeared that the preacher didn’t have any knowledge of textual criticism of the New Testament, so he couldn’t anticipate that most of the congregants wouldn’t have that part of the Prayer in their Bibles. And that they would be confused and ready to be taught. But anyway. It should be clear that this is in no way a “generic” prayer. As Levine says, it actually doesn’t say anything explicitly or uniquely Christian, and in fact it “fits neatly within Jewish piety.” It is “[p]rovocative, directly related to human experience, intimate enough with God to be direct, [and] an ideal prayer for a first-century Jew” (51).